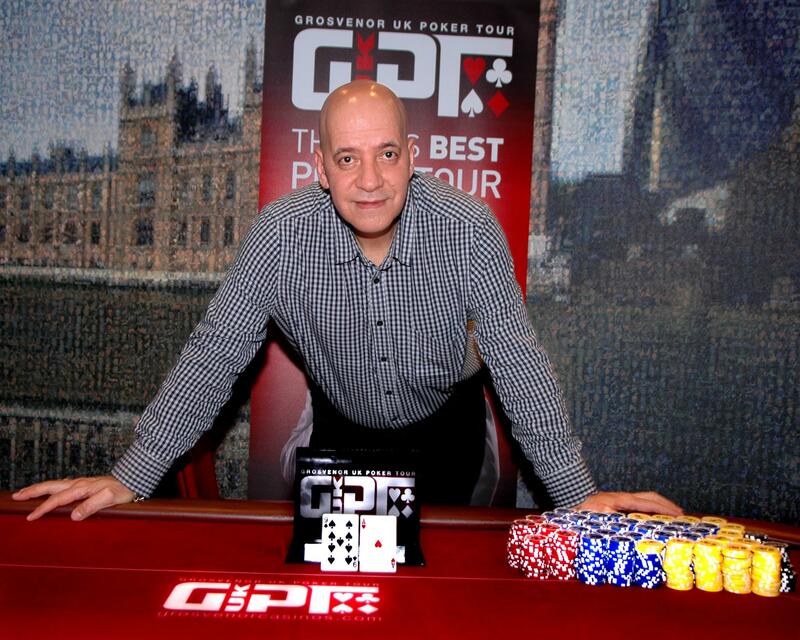 Martin Bader is £56,000 richer this morning after topping a field of 397 at London’s Victoria Casino to win leg one of the 2013 Grosvenor UK Poker Tour. 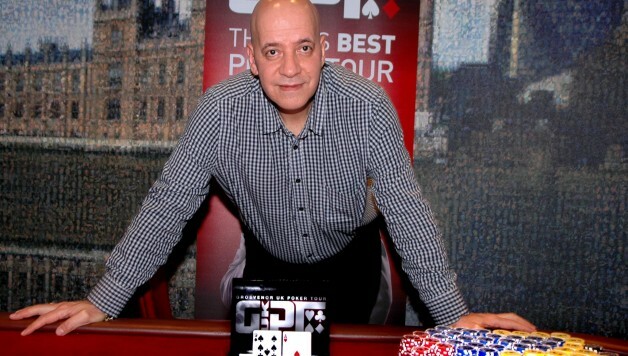 The 51-year-old event organiser, a regular at the Vic for 17 years, defeated David Barraclough heads-up to lift the first GUKPT title of the year, although his opponent actually took home more money, £62,000, after a series of chops five handed, four handed and heads-up. The original first prize was £103,240. In the final hand, short-stacked Barraclough moved all-in with K-5 and Bader called with A-9. A board of 4-4-Q-Q-3 was no help and the man known online as ‘Doobs’ had to settle for the runners-up spot, appeased by taking the lion’s share of the money. A star-studded field had gathered at the Vic for the two starting days, including WSOP bracelet winners Freddy Deeb, Willie Tann, Chris Bjorin and Craig McCorkell, and WPT champions Marvin Rettenmaier and Surinder Sunar. Tann and Rettenmaier were among the 38 players to cash, but both fell short of the final table, as did online pro Rhys Jones, who with just under 150,000 was the biggest stack of the 158 players to make it through to the day 2 from days 1a and 1b. However, the final nine was not short of star names, with Vic regulars Jamie Roberts, Jeff Duval and Paul Alterman all trailing former Sunday Million champion and top online pro Marc ‘Dean23Price’ Wright, who with nearly 1.9million chips was 650,000 clear of the field. Wright’s chip lead was extended as soon as the final table started, coming out on the right side of a huge cooler against Sin Melin, whose ambition of becoming the GUKPT’s first female winner was over almost before it began. Wright opened in early position and Sin made the call with A-Q. When the Cornwall-based Londoner continued on an A-J-9 flop, Sin again called, turning top two pairs when a queen fell on fourth street. Unfortunately for her, Wright had turned a straight with T-8 and after getting all the chips in on a blank river, Wright had more than a third of the chips in play with eight left. Sin departed with £7,150 for ninth place. If ever there was an illustration of the fickle nature of the poker gods, it came soon afterwards in the hand which saw Antonio Millan depart in eighth for £9,530. The Spaniard shoved his short stack and lit the fuse for a monster pot which saw Wright relinquish his chip lead to a painful badbeat. Jamie Roberts just called Millan’s shove, and when Wright squeezed all-in from the big blind, the second generation pro was only too happy to call again with his pocket kings. Marc had the bullets though, and was in a great position to shoot down both Jamie and Antonio, but the dealer dealt a king high flop, and with Antonio holding A-T, Wright couldn’t find his one out and doubled Jamie up to over two million chips. Just like Marc before him, Jamie couldn’t hang on to the chip lead for long, calling a river shove from Paul Alterman, who was happy to turn over his flopped set of sixes and assume the chip lead. Chiraag Thanki had been the chip leader of the 21 players who returned for day three, but he had started the final as the short stack, and his resistance came to an end when Bader’s K-Q bested his A-9 with a queen on the flop. Thanki took home £13,100 for his weekend’s work. Six-handed play didn’t last long, with Jamie and Marc going to war for the second time. Again Marc held the dominant hand, A-Q against K-Q, but this time he didn’t get any nasty surprises from the deck and Jamie departed in sixth for £16,670. With five left and blinds at 25k 50k the players agreed the first deal, taking £45,000 each and leaving the other £38,000 to play for. The deal certainly accelerated the action, with Wright getting his stack in with pocket deuces against the jacks of Barraclough, giving Doobs the chip lead for the first time, before getting the scratch in with A-Q against Martin’s K-Q, which rivered a straight. With four left there was another chop, with each player locking up an extra £5,000, £50,000 in total, with £18,000 to play for. Barraclough was big favourite to take the title when he extended his chip lead further with the knockout of Jeff Duval in fourth place. Both players held an up and down straight draw on a 3-4-5 flop, but Barraclough’s A-6 had Duval’s 6-8 dominated, the ace on the river sealing his fate. Doobs continued his one-man wrecking crew, making a big call with A-2 blind on blind against Alterman and despite flopping straight and flush draws with his Q-9 suited, Paul departed in third. Barraclough held a massive advantage heads-up, with around 6.8million to Bader’s 1.1million, but having run good throughout the final, the luck seemed to desert him when he needed it most. First of all he doubled Bader up with A-7 against his pocket sixes. At that point the two finalists agreed a final chop, with Barraclough taking £62,000 and Bader £56,000, but they played on for the title and the £2,125 seat to the Grand Final, added by Grosvenor. The crucial clash came soon afterwards in a three-bet pot. Bader raised the button and Barraclough reraised to 500k. With a million in there preflop, Doobs continued for 600k on the T-T-3 flop, and when Martin shoved for 2.8million total, he found a crying call with A-K.
Bader had flopped trips with the Doyle Brunson, T-2, and when another three on the turn housed him up, he took a massive chip lead, finishing the job soon afterwards. Bader admitted that he hadn’t been that keen on the first chop, but the pursuit of the title was the main thing for him. He said: “It’s great to win the title. Money is only money but I’ve been knocking on the door for a long while wanting to win a major trophy. “I’ve been nursing a short stack right from the beginning of the tournament, I literally never took off. I had a couple of bad beats but managed to hang in and obviously the T-2 hand was crucial. Next up on the tour schedule is Leg 2 at the G Casino in Didsbury, Manchester from the 8th to the 14th April, with the £500 + £50 main event commencing on Thursday 11th. See the ‘Events’ tab on www.gukpt.com for further details.